Description: In Sky Hawkins's family, leading your first heist is a major milestone--even more so than learning to talk, walk, or do long division. It's a chance to gain power and acceptance within your family, and within society. But stealing your first treasure can be complicated, especially when you're a wyvern--a human capable of turning into a dragon. My Thoughts: Sky Hawkins is a wyvern. She's also the youngest in her family, having three older brothers. Her ancestors were exiled from Home through a Door that had disappeared. Wyverns have done quite well on Earth gaining wealth and being the target of paparazzi. Sky's family has recently lost wealth and status when her mother's most recent heist was a failure and resulted in her disappearance. Sky's family has been shunned by the others. It was especially painful for Sky because it was her boyfriend Ryan who shunned her at the most recent Reckoning. Sky is determined to complete her mother's heist and restore her family's honor and place in their society. Leading a successful heist is a mark of adulthood in her society. Her ex-boyfriend convinces her that he shunned her on order from his father, the head of the Council, and wants to help her plan the perfect heist. Sky also recruits a human friend from school who is just about the only one who will have anything to do with her there. Gabriela is fascinated by dragons and is especially in love with unicorns which are native to the dragon Home. Sky also needs a wizard to help with some of the spells needed for her heist and recruits Maximus who is one of the few wyvern wizards. Sky and her crew need to work in secret. Her father and older brothers are all against any tries to clear their mother's name and complete her heist. Sky is determined and the group comes up with a plan that should work. However, things go wrong in a big way and Sky finds herself exiled to the dragon Home world which isn't the paradise wyverns on Earth believe. Although she is reunited with her mother, what she learns about Ryan's father's actions makes her determined to return to Earth and set things right. I thought the world building with dragons living on Earth as celebrities was well done. I liked the Sky was such a determined person. I also liked the crew of new friends that she gathered around herself. I liked that dragons on Earth believed that they no longer had the ability to shift into to their dragon forms even though they they hadn't lost their ability to breath fire - to one degree or another. The one thing I liked about Home was that Sky learned to shift into her dragon form. I didn't like the rigid class society there. 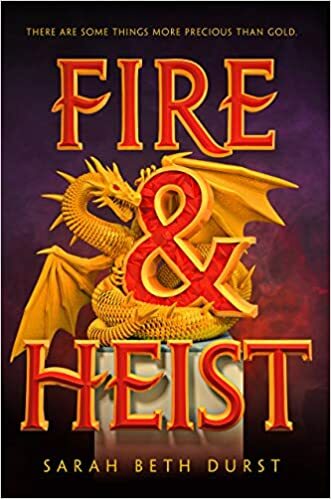 Fans of dragons, heists, and friendship will enjoy this story. You forget about past and future when you climb. That's one thing I love about it, when you slip into this moment that is purely now. In now, there is no guilt or regret or worry or fear. There's only the doing.